- How low do the bond yields have to go before investors say it’s just not worth buying this investment class? I guess the question also with this is where else do you put your money? - Will rates reducing (if they reduce) encourage the average punter on the street, who is already in debt up to the eye balls, to head back out onto the street and get into even more debt. Have we reached the point that while the can was being kicked down the US road many times, that it took so much concentration that they didn’t look where they were going and have run into a cul-de-sac so the authorities can kick no more? Even if they do force a recovery this time what happens after the next boom? There will always be another bust. I bet interest rates will still be low, the QE will not have been retracted. Do they start offering negative interest rates? Do they just QE until the economy collapses once and for all? Lots of questions today that as an Average Joe I can’t answer. Please though drop a Comment if you have some thoughts. Some answers that I can supply today though is what is happening to the S&P 500 CAPE or PE10. As regular readers know I am using the S&P 500 cyclically adjusted PE ratio to try and squeeze some extra performance out of my portfolio. This method is used by Professor Robert Shiller however I have modified it slightly by incorporating forecast earnings (even though they can be sometimes very bullish in my opinion) up to the month of interest. Unfortunately this month though Standard and Poors have all forecasts after the first half of the year under review so my Earnings only run until June 2010. If you would like some more background information on the CAPE then head here and if you’d like some more information on why I use the CAPE then head here. 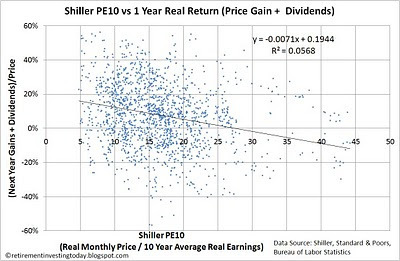 My 1st chart plots the Shiller S&P 500 PE10 that is now at 20.2 which is up from 18.6 at my last update. My UK Equities target asset allocation therefore decreases from 19.6% to 18.6% (nominal based on buy & hold would be 21%) and my International Equities target asset allocation decreases from 13.9% to 13.3% (nominal based on buy & hold would be 15%). The Shiller S&P 500 PE10 Average stays at 16.4 meaning we are still, even in this current troublesome economic climate, well above the long run average. In fact we’re nearly at the 80 percentile which today is 20.6 while the 20 percentile sits at 11.0. 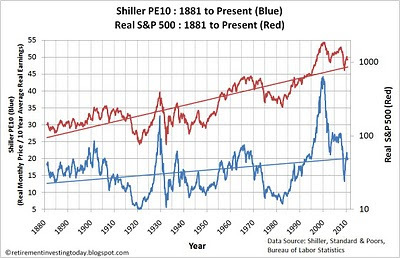 The reason why I use the Shiller S&P 500 PE10 can be seen with today’s correlation with the Real (ie after inflation) S&P 500 Price which is currently 0.78. 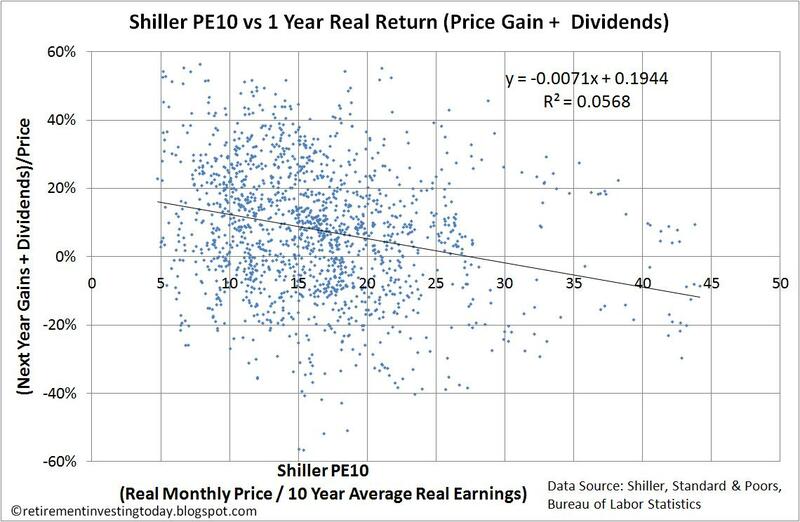 This can also be seen in my 2nd chart which while the R^2 is low there appears to be a trend, particularly as the PE10’s get large (ie very over valued). 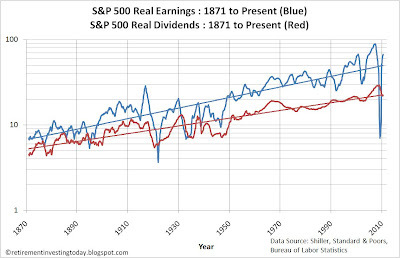 My 3rd chart simply plots Real (after inflation) Earnings and Real Dividends for the S&P 500. Today I’m only showing these until June as no forecast data is available. 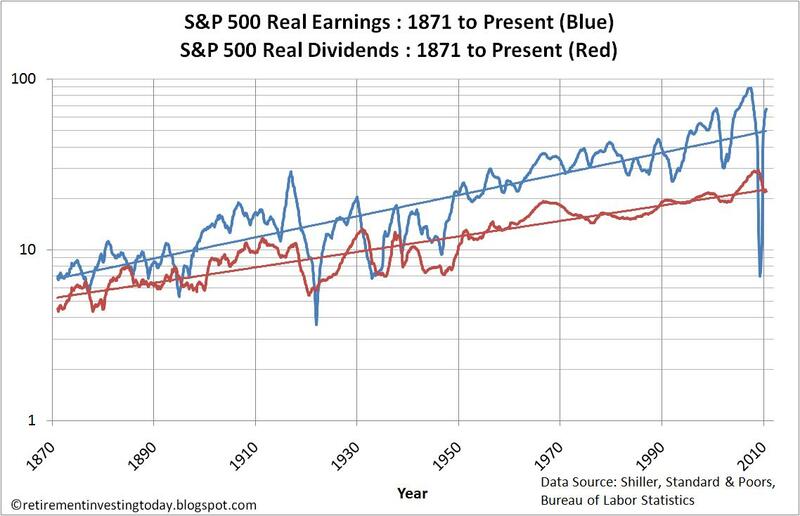 Eye balling the chart though shows Real Dividends close to the long run trend line while Real Earnings are again above trend. Maybe it’s all those low interest rates and QE helping. At least for now. - Prices are month averages except August ‘10 which is the 11 August ’10 S&P 500 stock market price at 17:15. - April ’10 to June ’10 reported earnings are estimates from Standard & Poors. S&P has June 2010 earnings estimated at $67.20. Later month estimates were under review at time of writing. - Inflation data from the Bureau of Labor Statistics. July and August ‘10 inflation is extrapolated. - April to June ‘10 dividends are estimated as the March ‘10 dividend. You are right; the 'can' can only be kicked so many times before it can't be kicked any longer. It seems that we're either going to end up with a nationalization of many of the means of production, and a complete stagnation of the economy, or we'll eventually have to let the ball drop and hit the reset switch, so we can start out on a clean path forward.